With delicious fine dining, wine bars and plenty of places to relax and unwind you’re in for a treat on Ventura. There’s also a tranquil spa, sports facilities, a well-equipped gym and four pools. In the evening there’s plenty of places to be entertained including a show lounge, three-deck atrium with dance floor and show lounge. 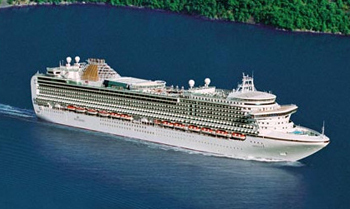 View all Ventura cruises or view more options for P&O UK cruises. Stop by Ventura’s spa reception to book your next appointment or enquire about the array of different treatments available. Located just outside the spa and salon on Deck 16, our helpful staff will be on hand to answer any queries. Like to keep on the move? Ventura’s sports court is the place to go for a spot of five-a-side, tennis, cricket or basketball. Located atop the ship on Deck 17, children and teenagers can burn some excess energy, while adults might take part in activities such as Tai Chi and outdoor aerobics. Enjoy fresh air and great views on the open decks. A great place to watch your ship glide gracefully into port or to watch the ocean rush by when at sea. If you are here holidaying with a very young child, then Ventura’s nursery will be a welcome addition to the ship. There will be a soft play area for child and parent time during the day. While for sleepy heads a night nursery with cots and beds will be open from 6pm to 2am. Parents can settle their child down to sleep and then enjoy the evening knowing they will be paged if there are any problems. The Night Nursery is free of charge and based on a first come first serve basis. The Reef can be found on all family friendly ships and offers free, age-appropriate activities for children of all ages throughout the day and into the evening all staffed by a fully trained team of Reef Rangers. Fun activities range from themed day activities, sports challenges, games, quizzes and much more. Ventura has five areas for different ages Tumblers Nursery, The Den, Decibels, Jumping Jacks and Toybox. Teenagers will be in their element on Ventura. They will find a Game Arena to challenge friends to a game of table football or the latest video games. While a funky, modern chill out area that’s all their own comes complete with DJ’s decks. With less emphasis on organised activities, teenagers will enjoy the opportunity to make new friends. Later events such as discos will create a party atmosphere. A superliner designed to provide inspirational holidays for all ages, life on board Ventura will be exciting, spontaneous and full of surprises. All around modern, interactive and tactile art will fascinate and engage you. As you turn each corner you will discover something new, vibrant and often quite unexpected. During the day you can savour rich coffee and conversation in Tazzine, rejuvenate in the lavish spa, race cars around a giant Scalextric track, refresh yourself in one of the ship’s inviting pools or bounce on bungee trampolines in Cirque Ventura up on the open deck. Off her stunning three deck atrium you will find a tempting selection of shops, bars and eateries. After dark a kaleidoscope of sights, sounds and tempting aromas will enliven an already elevated mood. Flexible and innovative, evenings will offer a real sense of freedom. Dine in her unique fine dining venue, The White Room, created by Marco Pierre White. Watch one of the vibrant show in the Arena Theatre. Gaze at some of the world’s most captivating cityscapes as they are revealed, in real-time, on Metropolis’ 20 metre wide floor-to-ceiling video wall. With a stage and dance floor you might dance to a live band or DJ, take part in some karaoke, or enjoy some late night cabaret. This vibrant venue will get livelier as the night progresses.